Blowout Sale! Save 73% on the Kingsdun 10 in 1 Magnetic Precision Screwdriver Set Repair Kit include Pentalobe Tripoint Flathead with Metal Spudger Tool & ESD Tweezer Set for Iphone & other small electronics by Kingsdun at Andy Pemberton. MPN: KS-8865-10PCS. Hurry! Limited time offer. Offer valid only while supplies last. 5PCS PRECISION SCREWDRIVER : This set included Pentalobe screwdriver set P2(0.8mm) P5(1.2mm),Tripoint screwdriver y000(0.6mm),philips screwdriver PH000(1.5mm) and flathead 2.0mm, all with long handle, easy to use and hold in hand. DUAL ENDED METAL SPUDGER SET: this set include 3pcs dual metal spudger tool set and 1pc plastic spudger. Non-skid handle and varies of blades, multi-purpose opening pry tools. Help to remove screen of your cellphone easy with no damage. IPHONE REPAIR TOOL KIT: Penlobe P5 and Philips PH000 can be used for most types of IPhones, the tri-point Y000 is exactly used for your iphone 7, pentalobe P2 can be used for your macbook repair. necessary tools for your iPhone repairs,screen remove or battery change. 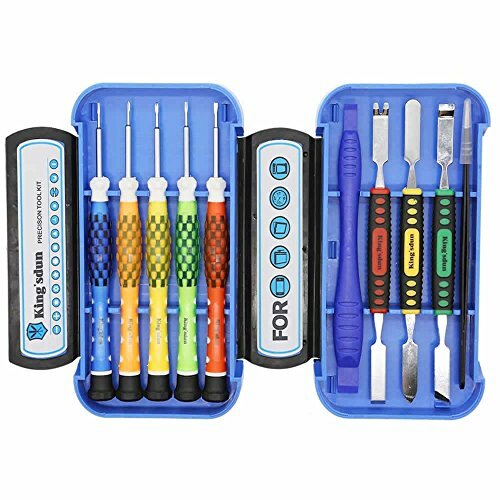 SMALL SCREWDRIVER SET WITH CASE: 10 in 1 sturdy plastic box, easy to hold in one hand, portable and easy to store. Compact and well organized. MUST HAVE TOOL KIT: Perfect tool kit for DIYers and a must have set for small devices repairing,cleaning. If you have any questions about this product by Kingsdun, contact us by completing and submitting the form below. If you are looking for a specif part number, please include it with your message.